Workplace Safety Blog | Safetycare | Safety Training Videos | Free Safety Pictures and Resources: Welding / Manual Handling / Traffic Management / PPE shocker! Welding / Manual Handling / Traffic Management / PPE shocker! This picture has a Welding, Manual Handling, Electrical Safety, Traffic Management and PPE shocker all in one! 1. He's having to hold the welding unit...and above his shoulders. 2. 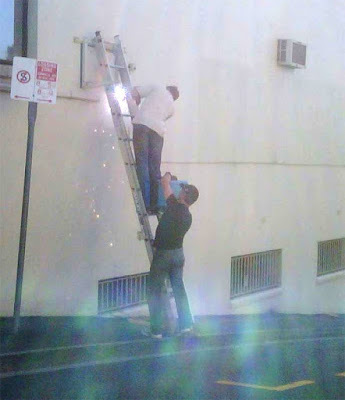 He's providing an anchor for the ladder. 3. He's the traffic manager for any pedestrians and passing motorists. 4. He's collecting the welding sparks and fumes. 5. And neither of them are wearing any eye protection making 'Arc Flash' or Arc Eye' almost a certaintly.